Do consumers (really, all of us) know what’s best for us? Maybe we do, maybe we don’t. Even if we think know what is best, how do our perceptions affect our actions? Let’s consider this in the light of New York’s new ban on over-sized, sugary soft drinks (larger than 16-ounces). Will consumers buy two 16-oz. 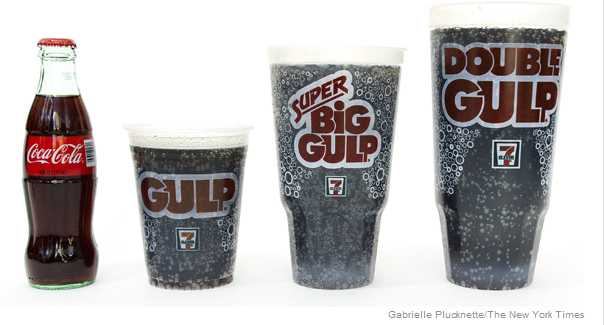 drinks to meet their sugar intake needs, instead of one 32-oz. drink? Can we even tell the difference? A Harvard Business School scholar recently tested the idea that consumers know what is best for them. In a test with 294 people, each was asked to estimate how much liquid was in a range of cup sizes, starting at 12 oz. up to 50 oz. Respondents consistently guessed wrong by assuming that larger cups held 20-40% LESS liquid than the cup actually did hold. Similar studies with jelly beans, popcorn, ice cream, and drinks have shown similar results – consumers cannot perceive serving sizes accurately. According to The Cornell Food and Brand Lab, studies have shown that people dramatically underestimate just how many food-related decisions they make every day. On average, we make roughly 221 decisions about food every single day. These decisions are also significantly impacted by the environment – everything from ads, package sizes, plate sizes, and more impact our food and shopping choices. Spoon size can alter your perception of medicine consumption. People unknowingly serve themselves more when they use a larger plate. Heavier people exhibit different eating and sitting habits at a Chinese buffet. Children who use cash to pay for lunch often make healthier choices. The human brain has a difficult time with geometry and cannot often accurately judge when an object has doubled, or even tripled, in size. When we double the size of something, it rarely looks twice as big – it seems only 50-70% larger. Do you still want that 50-oz. soda? Ask students to write their estimate on how many decisions they make about food every day. Include “how many, who, what, where, when, and how much” decisions they made for a typical snack, beverage, and meal – and how many meals, snacks, and beverages they ate during a typical date. Tally the numbers on the board. Discuss results – what were the surprises? Next, ask students how well they can judge serving sizes. Then, have students take the serving size quiz at www.well.blogs.nytimes.com/2012/06/21/the-well-quiz-supersize-soft-drinks . Discuss the results of the quiz. What can these results indicate for marketing products? Discuss other packaging options. Example: snack sized (100 calories) packages for cookies, chips, crackers, etc. Why do companies have these various packaging sizes? Since consumers are not good judges of sizes (given the quiz results above), do companies use this psychology to the its advantage? What are the responsibilities of companies in this matter? What data could be used in marketing of food, drink, and restaurants?